Now that October is nearly over our thoughts are starting to turn to Christmas. 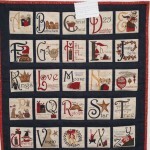 Over the past couple of years I have been using a lovely traditional Christmas alphabet fabric to make different items. This year I have used the last of it to make an heirloom advent quilted wallhanging and a bell pull style wallhanging. Each picture on the advent is a pocket for you to put in items of your choice. Small gifts, chocolate bars, animal treats dependent on who lives in the house. Instead of opening doors on the advent numbered 1 to 25, you start at the letter A and get a small surprise each day. As I made this from my own pattern with fabrics from my stash you will never find another advent the same as this one. 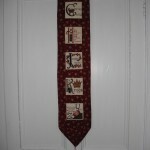 The Bell pull hanging used up the last of the Christmas alphabet fabric. I bordered it with a deep burgundy cotton fabric with gold stara stamped all over it. It hangs on a pine coloured dowling with matchind wooden beads on each end. It is finished off with a long burgundy tassle. This entry was posted on Monday, October 26th, 2009 at 7:44 pm	and is filed under New creations, Uncategorized. You can follow any responses to this entry through the RSS 2.0 feed. You can leave a response, or trackback from your own site. This advent is now rehomed in Derbyshire.